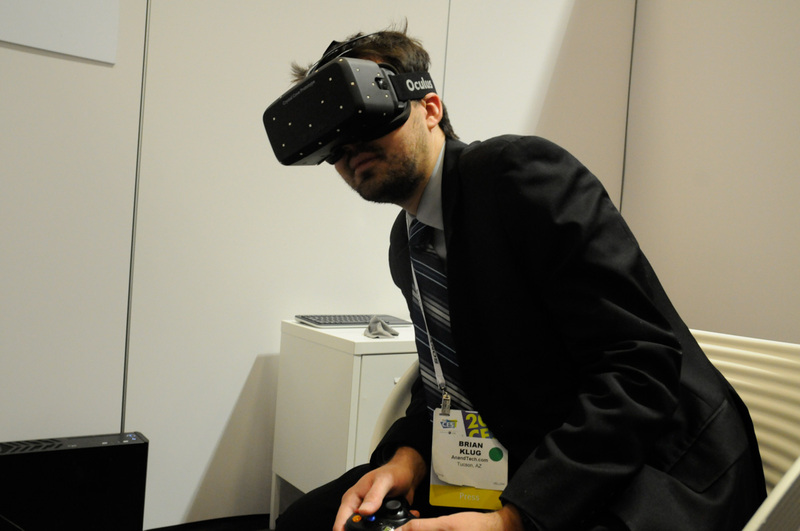 Last year, one of the most intriguing and hotly anticipated things I saw at CES was the Oculus Rift. Although the hardware was still early, and the display not the highest resolution, the demo was the most convincing virtual reality experience I had experienced to date by a long margin. The combination of an adequately fast and accurate IMU (inertial measurement unit), the right kind of tuning, and adequately immersive demos made the Oculus experience really the first credible experience. 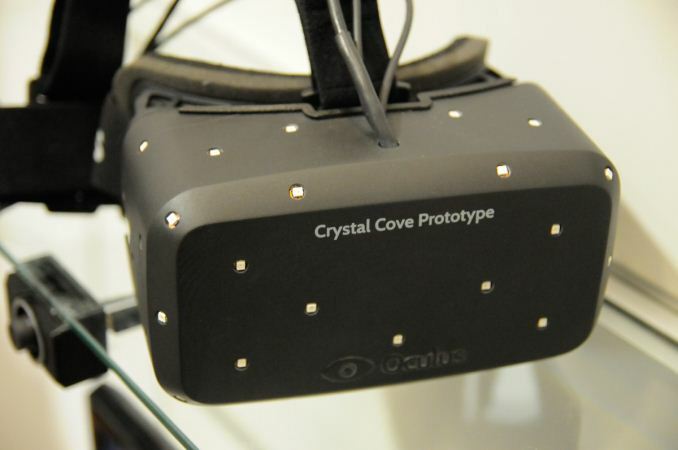 At this years CES, Oculus is back again with a newer version, codenamed Crystal Cove, which is a much more polished (but still not final) unit with a number of planned improvements. First and arguably most important is positional tracking, which utilizes a number of infrared LEDs mounted all over the front of the chassis and a camera ahead of the unit to track the position of Oculus, and in turn the wearer's head. This enables the unit to track and move the camera around as a wearer leans or moves their head. This increases immersion by allowing you to lean closer to and inspect objects in the game world around you. At the same time, positional tracking helps mitigate one of the biggest factors that contributed to disorientation in the previous versions that only tracked orientation of the head. Without positional tracking, the result is that the image presented to the visual system (your eyes) no longer matches the stimuli being fed to your brain by the inner ear, since you naturally move your head around while looking at things instead of just pivoting your head with the shoulders held fixed in place. The positional tracking system was impressively robust, correctly tracking subtle movement of the goggles even with my head facing nearly opposite the camera. It's clear that Oculus has provided enough target LEDs for tracking the goggles in a robust fashion. In addition, the the demos I tested failed gracefully when the system finally lost positional tracking, de-saturating the scene to signal to the viewer that tracking was lost and only the inputs from the IMU persisted for movement. Tracking was smooth and range was impressive as well, I could lean all the way forwards and left and right without moving out of range. The other improvement is to the display and image quality presented to the user. Part of delivering a credible VR experience is fast refresh with minimal latency and image persistence, something the previous version I had seen admittedly struggled at (persistence especially). Moving your head around needs to be low latency, low judder, and more importantly not smeared by hysteresis from pixel response. The display resolution itself has increased since last I saw it, from (1280x800) WVGA to 1080p. In addition, the panel type has changed from LCD to OLED, which has much faster pixel response time (~20 ms for a typical backlit LCD compared to as low as 1/1000 ms for OLED) and minimal image retention. Oculus seems to still be constrained by the current status of the mobile display market, given the 5-6 inch size of the display and desired resolution, but it's obvious that eventually they'll move their own custom panels given adequate volume. While the OLED display does have minimal smear and excellent response time, I did notice the presence of a non-RGB subpixel matrix, PenTile (RG,BG), which was distracting. I still want higher resolution, and I'm sure Oculus does as well. 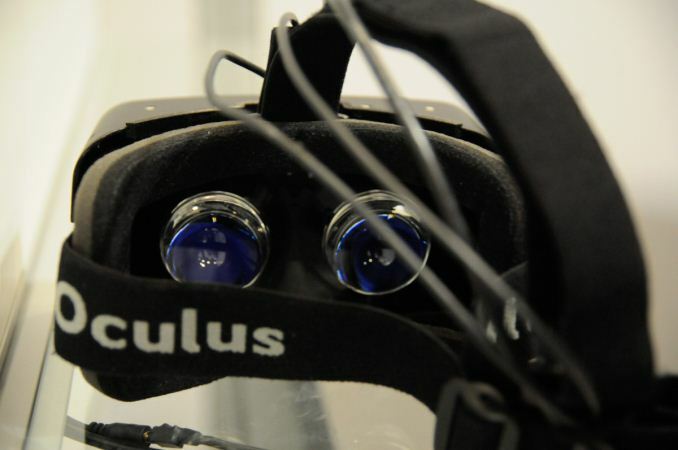 Oculus also has a low persistence mode that flashes the incoming frame briefly and blanks the display in-between, which results in smoother movement without the human visual system perceiving judder from the frame being displayed continually until a new one appears. The brain fills in the gaps between frames and the result is an increased perception of smoothness. Oculus demonstrated the system with this low persistence mode enabled and disabled, I wouldn't say the effect is dramatic but definitely improves the experience when you're moving your head quickly. In addition the Crystal Cove has a new optical system and correspondingly better glass and viewing angles, which improve peripheral vision considerably. Oculus showed off two games, the first was a space-based dog fighting game called EVE Valkyrie, built by the same developers and set in the same universe as EVE Online. The second was a tower defense game demo from the Unreal Engine 4 development kit (UDK). Both performed very well and integrated natively with positional tracking. Oculus remains the most compelling virtual reality experience I've experienced to date and a product to watch. The addition of positional tracking dramatically improves the experience, and lower image retention from using OLED both work together to dramatically reduce the disorientation that was common with earlier development kit units. By the time this thing actually comes to retail (if it ever does), we will have been fed constant hype for three years. It's too much, by far. I mean seriously, every little nuance of change, every game that adds support, and every time Carmack takes a dump at Oculus HQ - at some point, it stops being interesting journalism and becomes a simple regurgitation of marketing press releases that nobody needs to be reading. Too much hype. I thinks the reporting just shows that a decent development cycle takes time. To develop a good new product that is not half backed is a long and slow process. We usually don't see it because it happens behind the scenes and companies usually announce once they have advanced production prototypes. Oculus is a start up that is using a open venture capital process so we will see the whole process. Once they get it right and release, the knock offs will come rolling out much faster because they know what works and everyone will say that it was obvious how to do it, we just had to wait for the technology. Disagree completely. Would you rather they dumped a half-assed beta product that may lure some geeks, but won't be good enough for the normal people, or wait until they make it really good? They definitely need to stop implying it's coming out in a given year when it's clearly not. I'm also not convinced they're ever going to release it. They keep adding more and more crap to it, adding more and more employees to their roster, and sucking in as many investors as possible. When you go above 1080p you really need to start thinking about GPU horse power to attain an appropriate frame rate. There's also a trade off between 1080p@120hz and 1440p@60hz as low persistance at 60hz can flicker.